Thanks to the Xbox Reveal event, we were able to see the first gameplay footage of Call of Duty: Ghosts for the Xbox One and PlayStation 4. While we received the first concrete information on the game, a few small details on the multiplayer, and the addition of a dog soldier to the campaign, one of the glaring omissions was the lack of female characters. If you’ve ever jumped into a Call of Duty lobby, which is incredibly likely at this point, you’re well aware that the game is popular among both male and female gamers. For a game to have such a diverse audience and be so engraved in the gaming culture, why don’t we see female soldiers in the game? It was confirmed today that Call of Duty: Ghosts would have character customization in multiplayer, but the mention of female options was surprisingly missing. Call of Duty isn’t the first game to deal with criticism for not including females as playable characters. It wasn’t that long ago that the Gears of War series was ridiculed for not providing female options to choose within multiplayer. The series didn’t really have an excuse either as Anya, a female character who is integral to the game’s story, was nowhere to be found in user-versus-user battles. Gears of War 3 finally understood just how important the representation of females as an option was, and they’ve now become some of the more popular characters to use online. Adding playable female characters to the game wouldn’t be a “first” for Call of Duty, however. 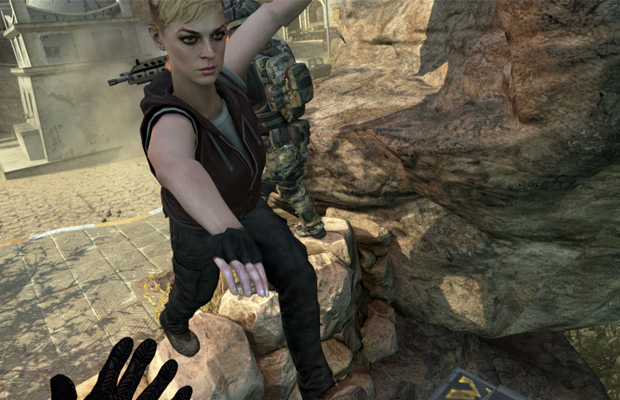 In Call of Duty: Finest Hour, Tanya Pavelovna became the first female in a Call of Duty title that you were able to control. In Call of the Dead, a Zombies campaign for the series, Sarah Michelle Gellar was an option. Earlier this year it was stated that women will be able to fight alongside men in combat, which throws out the whole “realism” excuse that most modern shooters tend to use. The Battlefield series, Call of Duty’s biggest competitor, let it be known earlier this year that they will not offer playable female soldiers either. With Call of Duty being one of the most recognizable entertainment properties in our current time, the developers are in prime position to usher in the inclusion of female characters in multiplayer as the industry standard. Granted we were just teased with a few assets today, we hope that Infinity Ward & Activision take a step forward for the industry and look to include female playable characters. How do you feel about the lack of playable women characters in multiplayer shooters? Be sure to let us know what you think by leaving us a comment below, or discuss Call of Duty in our community. I get that many players don’t care either way. That’s cool. Personally, I think not having the gender option makes a game less interesting to me. I’m not saying that should be how everyone feels. Just saying that, having been in the military myself, and being female, I will say that my sister soldiers were a lot scarier than their male counterparts. Had beefy male drill sergents screaming spittle in my face and that didn’t faze me, but one single 4’11 female drill sergeant put the fear of God in us. Moral of story, don’t judge warriors by their size or gender. Let both genders be a choice for players.